You can walk in with two shopping bags filled with clothes or other items. If you have more than two shopping bags, please call to make an appointment. Typically, an appointment size is two full laundry baskets or tubs. Please pair clothes with their mates and put batteries in all battery operated items. We ask that all items are clean & smoke free, pet hair free and free of any odor of moth balls or storage. Still have questions? Refer to our Q&A section below or call our store, our buyers would be happy to help. What Are We Currently Buying? 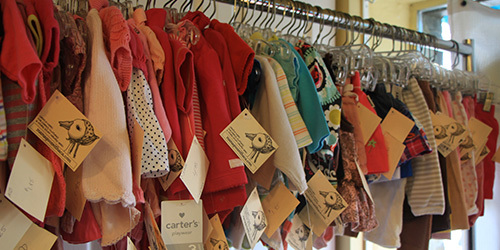 We are currently buying Spring clothes in sizes newborn – 14 as well as maternity wear, kids’ books, toys, baby equipment and more. Some of the hot items we look for in the spring are: high quality rain gear, cotton play dresses, sturdy, high-quality sandals, and wide-brimmed sun hats. While fall and winter clothes are now considered out-of-season for us, we are more than happy to take a look at any season, anytime! However, some sellers are more satisfied when they sell “in-season” clothing because we are able to buy more, and pay a bit more for in-season clothes. When we buy out-of-season clothing, we are more selective with brands/condition, and pay a little less because we will be storing it. Did you know that we take in walk-in amounts to buy on Sundays now? What Sizes Could We Use More Of? We’re always looking for gently-used clothes of all sizes, and the following sizes are in high demand! Halloween costumes & high-quality outerwear for any season. Baby monitors, swings, exersaucers, bassinets and other useful items. Are you looking for name brands? Brand is one of the factors that we take into consideration when we buy and price, so you will receive more for higher-end brands such as Mini Boden, Crew Cuts, Tea, Gap, Naartjie, Patagonia, Keen, REI, Kamik, Tucker & Tate, Hanna Andersson, and See Kai Run. However, we are happy to look at most brands, especially when items are sturdy, stylish and in good condition. Note: We do not buy clothing or items with prominent commercial characters or corporate logos on them or Garanimals brand clothing. Can I drop off my items and come back? We ask that you stay in the building while we look through your items, but you can browse at Mama Goose or Mimi’s Attic, next door. When we are done going over your items, we will let you know what we can offer you in cash or store credit. When do I get paid for the items I bring in? We buy clothes and most items “outright” and pay you the same day either 30% in cash or 40% in store credit. If you choose to be paid in cash, we will pay you with cash (up to $30) or by check if over $30 that day. If an item is going to sell for more than $15, we typically consign it which means you will be paid after the item sells. When we consign an item, we work with you to find a selling price that will work in our market. You will receive 50% in cash or 60% in store credit after the item sells (and after a 7 day return period). 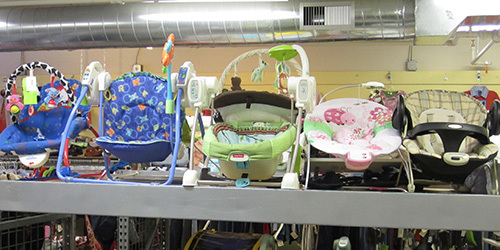 Consignment is a good option for special, higher-cost, items and things that people will want to take home and make sure they function, such as electronic baby equipment. After we have gone through your items (and discussed possible consignment items), we will tell you what we can offer you. You will receive 10% more if you choose to be paid with store credit. We will create a store credit account for you in our computer which you can use that day or whenever you’d like. It will never expire and you won’t have to hang on to any paperwork. You can use your store credit to purchase anything in the store, including our new products. 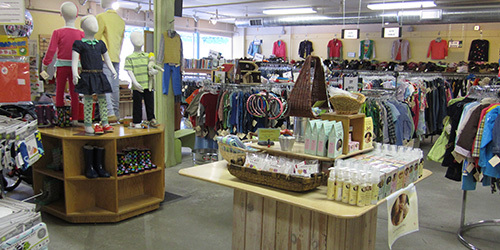 You also have the option of transferring your store credit next door to Mimi’s Attic! What toys do you take? We buy classic toys in good condition. See “Things We Do Not Buy”. What are things you do NOT buy? Anything designed specifically for babies to put in their mouths. Painted wood toys that do not have the brand imprinted on them. Inexpensive plastic that can break and shatter. Women’s clothing that is not specifically maternity. How do I sell baby equipment? Typically, we consign baby equipment, pricing at half of what it sells retail; up or down depending on condition. Once your item sells, (and after the 7 day return period) you will be paid 50% of the selling price in cash or 60% in store credit. We will check the item for recalls when you get here (we need a legible model number). You can also check for recalls, yourself, before bringing the item in. Just go to www.cpsc.gov and enter the model number. If you have large items that are awkward or heavy, you are welcome to pull your car up to our Corn Street side door to unload. Call us when you get to the store, and we will open the side door for you and then you can go park. What kind of mama items do you buy? We buy current style maternity clothes, nursing bras in good condition, bella bands, and higher-end diaper bags.